Thanks so much for visiting Spotlight Fashion Link-Up today! 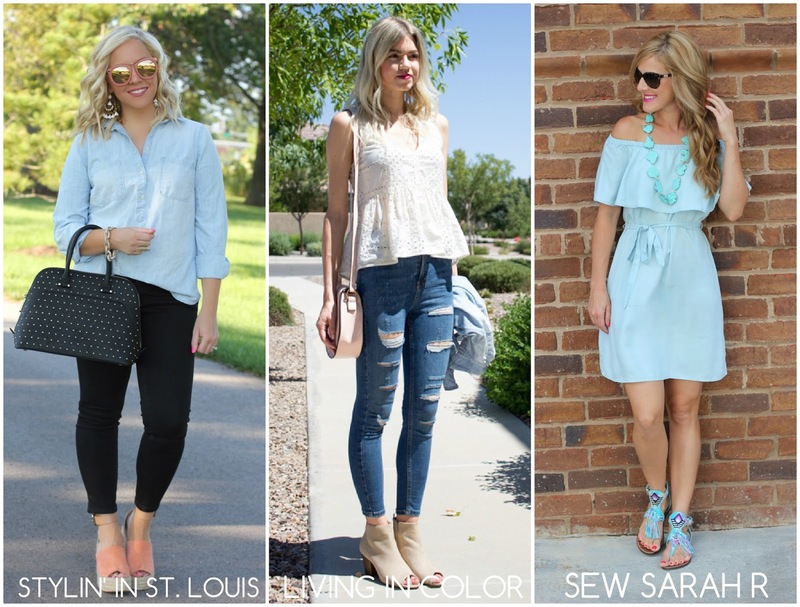 We’re styling our favorite chambray looks! My Topshop denim and white blouse are the perfect canvas to style a chambray top. Unfortunately I have to wear mine as an accessory rather than on me because it’s still roasting here in the desert, but you get the idea! Anyone else ready for Fall? Just me? Jacqueline and I post our link-ups every Thursday! This week our theme is chambray or you can pick any fashion/beauty related post to link up! Come back weekly to visit us! SPOTLIGHT: This week’s spotlight is Betsy of Two Peas in a Blog. Jacqueline and I adore her look from last week’s link-up! Be sure to stop by her blog and say hello! NEXT WEEK: for next week’s trend we’re featuring weekend style. Thanks so much for linking up each week! Have a fabulous rest of your day! Your little ones are too adorable!! Love that top, it's simply perfect! That eyelet top is to die for! So loving it on you! Love the eyelet top and how adorable are the matching sets!! Thanks for hosting and have a great rest of the week! I love this outfit! That top is summer perfection. 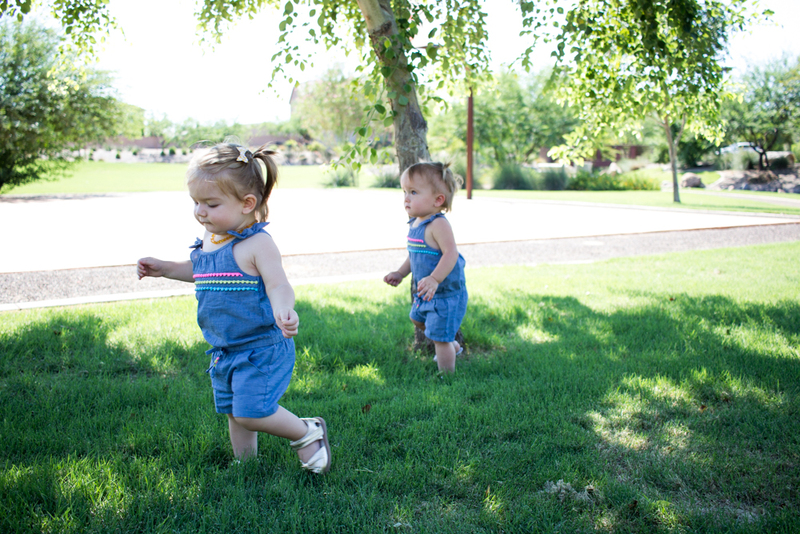 And the little ones are adorable in their chambray outfits! I love your eyelet top! Your babies are too cute! So cute! Love your top! I know that feeling—it's too hot outside for another layer, but many times I'll take my chambray shirt for the inside—the A/C can be brutally cold!! I love your eyelet peplum top! I also can't wait for it to be cool enough to wear my chambray top too! Lovely look! I adore that top. No, I'm not ready for fall. But I don't live in a desert like you. Fall is depressing to me because its the beginning of a cold long winter that never ends. the babies the beautifully dressed babies! love your look too! Love your distressed jeans! Can't get enough of those! Love those jeans with the eyelet top!